Just in Time For Christmas! 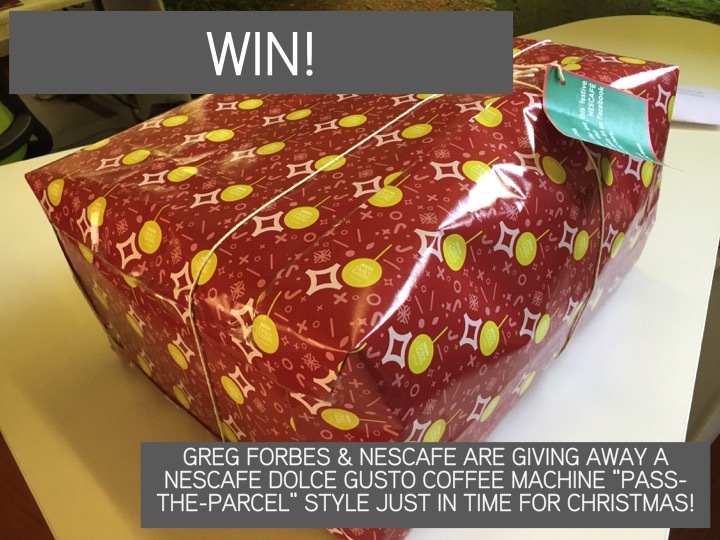 Play Pass-the-Parcel and win a NESCAFÉ® Dolce Gusto® coffee machine! For all those coffee addicts out there, NESCAFÉ® knows your pain, and wants to ensure that you keep drinking some of the best coffee pod coffee around. After all, if what the economists have to say is true, 2015 is going to be a particularly bad year – so here’s a chance to keep motivated every morning in 2015 with a fantastic cuppa-a-joe! As promised, we have a very exciting competition on GregForbes.co.za that could see you walk away with your very own NESCAFÉ® Dolce Gusto® coffee machine. But also, there are another 50 coffee machines up for grabs through the nifty little Facebook game NESCAFÉ® has developed. 2. Share the link on a social media site with @GregForbesMedia in the post. 3. You may, unfortunately only enter once, but I have listed both the NESCAFÉ® Dolce Gusto® SA Facebook page link as well as all the other bloggers taking part in the promotion below, so you have tonnes of opportunities to win. 4. As your comment comes us, I will unwrap one layer of the parcel – and if your layer is the last layer – you get the coffee machine! 5. Follow me on twitter and I will post your layer on your profile. NESCAFÉ Dolce Gusto Brings Festive Cheer to Facebook with “Pass-the-Parcel” Competition. What is a Christmas celebration without the rich and creamy goodness of a quality cup of coffee? With this in mind, stylishly clever capsule system, NESCAFÉ® Dolce Gusto® is giving the gift of coffee to Facebook users this festive season. 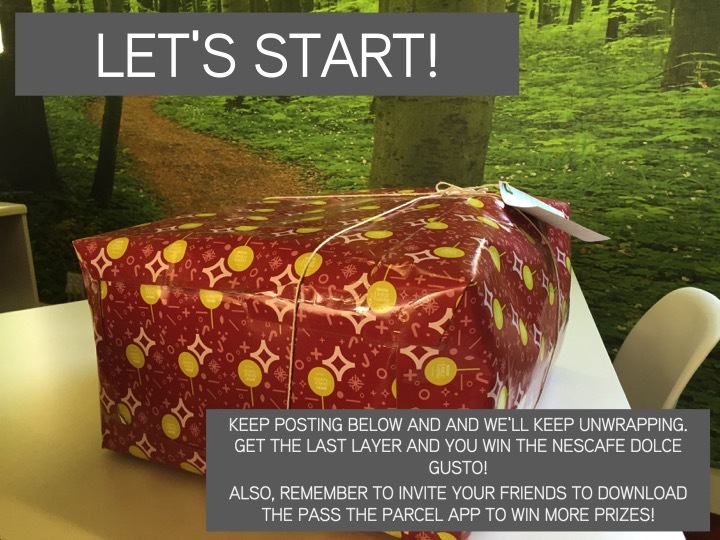 A fun application will see a virtual “pass-the-parcel” making its way among friends, until the very last layer has been unwrapped to potentially reveal one of 50 NESCAFÉ® Dolce Gusto® machines that will be given away from 09 December to 20 December 2014*. Visit the NESCAFÉ® Dolce Gusto® SA Facebook page (www.facebook.com/NescafeDolceGustoSA), to participate in a virtual game of pass-the-parcel. With a bit of luck, a parcel will either appear on your timeline or you’ll receive a Facebook notification telling you that, in true pass-the-parcel style, one of your kind and caring friends has passed the parcel on to you. You’ll be invited to click on the parcel to unwrap the next layer and if you haven’t been lucky enough to get past the last and final layer, you’ll choose a friend and pass-the-parcel onto them. They too will be given the opportunity to unwrap the parcel because isn’t that what friends are for? If you unwrap the winning layer, you stand in line to win a NESCAFE® Dolce Gusto® Coffee Machine, Cappuccino cup set, bubble capsule holder or travel mug. 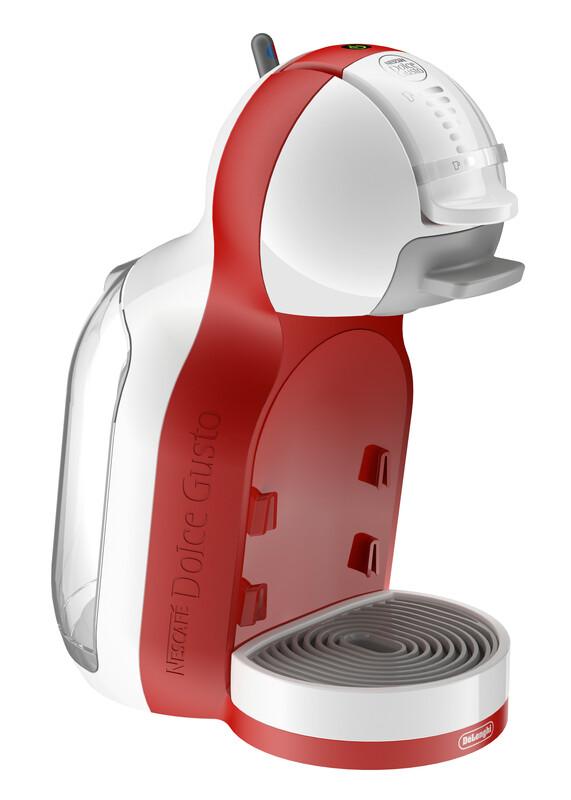 For more information visit: .www.dolce-gusto.co.za. Find us on Facebook atNescafeDolceGustoSA and on Twitter @dolcegustoZA. Here is the beauty you could be walking away with! Terms and Conditions – yip, there are some of these too. 1.1. directors, members, partners, promotional and advertising agents, merchandisers, employees or consultants of Nestlé (South Africa) (Pty) Limited and organisers of the Competition. 1.4. Persons under the age of 18 years. The app competition commences from 09 December 2014 until 20 December 2014 *. No entries received after 20 December 2014 * will be considered. 3.1. Go to the Nescafé Dolce Gusto Pass the Parcel App on Facebook. 3.2. Share the virtual Parcel with a Facebook Friend. 3.3. Once shared with a friend, the individual stands a chance to win a Nescafé Dolce Gusto coffee machine or one of three Nescafé Dolce Gusto accessories i.e.Travel mug, Cappuccino cup set or Bubble capsule holder (capsules not included). Participants who do not win any of the above- mentioned prizes stand a chance to claim a R500 discount on the purchase of any Nescafé Dolce Gusto machine at the stores mentioned in 3.4.1 below while stocks last. 3.4.1. Pick n Pay, Checkers, Makro, Game, Hirsch’s, Kalahari.com. 3.4.2. Consumers will be awarded an automatic R500 off the purchase price of their Nescafé Dolce Gusto machine when the barcode is swiped at the till or proceeding to check out on e-commerce platforms. 4.1. At the time that a potential prize winner is identified, the potential prize winner will receive telephone call from a representative of Nestlé (South Africa) (Pty) Limited or a partner agency of Nestlé (South Africa) (Pty) Limited at which point he/she may be required to provide his/her ID and/or driver’s license to the Nestlé (South Africa) (Pty) Limited representative. At the time of the telephone call, the potential prize winner may also be required to answer questions regarding his/her eligibility. Potential prize winner is not an actual winner until his/her submission is validated and his/her documents are completed and submitted to Nestlé (South Africa) (Pty) Limited. If a potential prize winner does not meet the eligibility requirements, the prize will be forfeited. 4.2. Eligible winners will have their prizes delivered to them by a representative of Nestlé (South Africa) (Pty) Limited or a partner agency of Nestlé (South Africa) (Pty) Limited based on the information they will have shared via the above mentioned telephonic conversation. @Isabel Goodman! Congratulations!!!!!!!! Finally we have winner! @paikinbrett – Thank you! Your Layer 20 was unwrapped to reveal Layer 21! Gotta be a very strong espresso! @Carryn, thank you! Your Layer 19 was unwrapped and showed its next layer – arg! Layer 20. @Nicola, Well, Ryan’s Layer 16 revealed your Layer 17, which in turn has unwrapped to Layer 18. Hey Ryan! Layer 16 good for you? Sheesh – who ever did this wrapping really didn’t know when to stop. Well done Belinda, you got Layer 15. @Susanne. Thank you, and Layer 14 is yours. Arg! @Gia – Sorry, Layer 13 is yours. Still a few more to go though. My favourite type of coffee is iced coffee on a hot day, or a hazelnut latte on a cold day. @Letitia – SO CLOSE! Layer 12 is yours. I thought it was possibly the last layer, but I stand corrected. @Sam – Layer 11 for you! But seriously, this parcel is getting thinner and thinner. Maybe 4th time is a charm? Drink of choice is Vanilla Latte. Also – I got out of bed for this, so really hoping that is the last layer. Hahaha. I guess there’s no way of getting another layer unwrapped? @Denver – Yip, this parcel was wrapped good and proper it seems. Does that mean there are STILL more layers? @Cece = Layer 8, @Candy here’s Layer 9 for you, and @Denver = Layer 10! Gimme a hot, strong Cafe Americano any time. With a dollop of hot milk. Winning. @Caileigh – yip, you are Layer 4, @ Mat – Layer 5 is yours, @D – Layer 6, and Martha – Layer 7 is yours! The package is looking a lot thinner now! My cuppa of choice has to be a good old macchiato! (@4thWiseMan on Twitter). Greg, this better be the last layer. Layer 2 goes to Stuart! @Stuart – what’s your twitter handle? Layer 1 goes to Verushka! So, who’s going to get the last layer?